Reader Question: Avianca Flight Delay, Separate Tickets & $1,100 Fee? 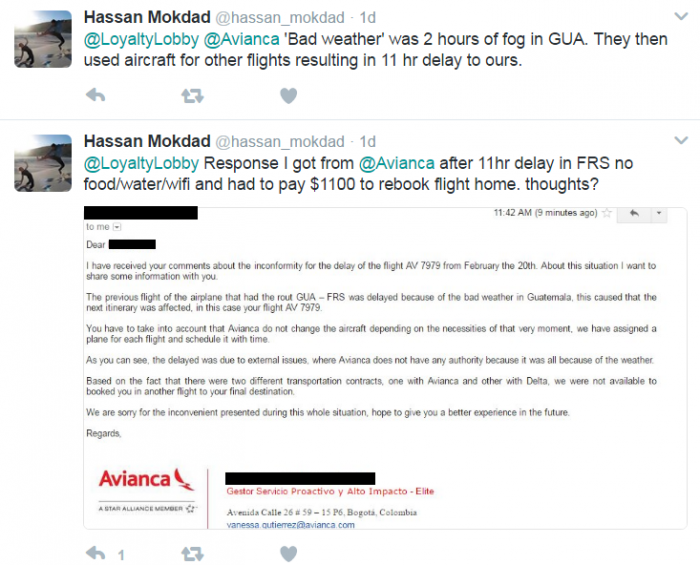 A LoyaltyLobby reader sent me a Tweet regarding am Avianca flight delay issue that caused missed connection on separate ticket and $1,100 fee? ‘Bad weather’ was 2 hours of fog in GUA. They then used aircraft for other flights resulting in 11 hr delay to ours. Response I got from @Avianca after 11hr delay in FRS no food/water/wifi and had to pay $1100 to rebook flight home. thoughts? Avianca’s responsibility is to transport the reader to the destination on the Avianca ticket. Seems that there was an unfortunate delay (first due to fog) and perhaps the airline chose to use the aircraft to some other destination. Airlines swap planes all the time to minimize the disruption to the network. Sometimes this may play to your advantage while other times it doesn’t. You always need to be very careful when flying on separate tickets. In case of long-haul flights, I try to book myself to arrive to the destination the previous day. 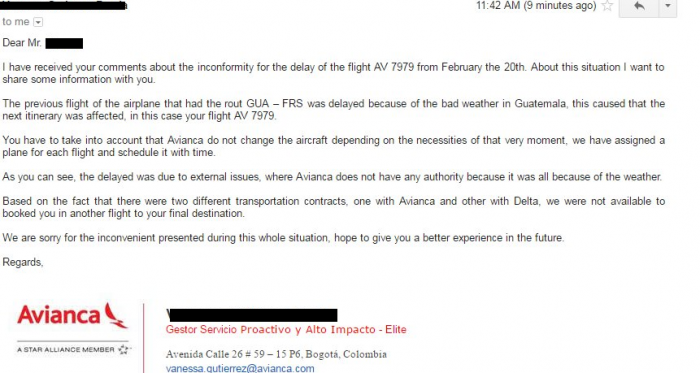 Seems that based on the Avianca’s response that the other flight was on Delta. Unfortunate situation here. Avianca may throw some Lifemiles to the reader for the inconvenience caused, but they don’t owe any cash compensation, however. There are pros and cons for flying on separate tickets (you can usually save a lot), but you always must be able and willing to buy a new ticket in case of missed connection. Yesterday, I wrote about Cathay Pacific that again is willing to check bags through on separate tickets. Thought that it would be time to remind readers what might happen when things don’t work in your favor.